Arsenal looking at Premier League defensive duo? The Gunners have enjoyed a fruitful start to the current campaign under Unai Emery and they are currently on a 21-match unbeaten run across all competitions. Arsenal have reportedly earmarked Manchester United's Eric Bailly and Chelsea's Gary Cahill as probable targets to reinforce their backline when the transfer window reopens. In between this, however, they have suffered a couple of major injury setbacks with Rob Holding and Danny Welbeck ruled out for the remainder of the season and this could force them to spend at the turn of the year. According to ESPN, Emery is concerned with the central defensive options available following the long-term knee injury to Holding and this could see them move for a new central defender next month. United's Bailly is understood to be one among the targets, having failed to settle under Jose Mourinho while Cahill is the other being closely tracked with his Chelsea contract expiring in seven months' time. 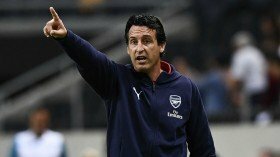 Arsenal have recently been boosted by the comeback of Laurent Koscielny after injury but Emery still appears keen on pursuing another option with the club still alive across all competitions.